American Patchwork & Quilting, Free patterns, Make It Yourself! Photo credit to Meredith Corp.
It’s always so fun to stumble across a project of mine featured again in a new article. Today my Pouf, which was originally made for an article in Make It Yourself Magazine including up-cycled sweaters, is in the daily Better Homes and Gardens mail! It was a fun project, colorful and functional. The body of the pouf is made from a cardigan, you can see I left it buttoned up! The top and bottom turquoise section was from a dyed leather coat. I loved the color then, and I still do. I’ve saved the remains of that coat, and have used it for other projects as well. Check it out! What do you think? Handmade gift review: This one’s for real! I wanted to share a fun gift I made at Christmas. I thought I was SO clever! Many of you have seen the fun up-cycled shopping bags made from pet food bags, my quilting buddies made quite a few! I didn’t really need more shopping bags, but THEN I had the idea to use that as inspiration to make a larger container to store firewood! It would have to be more or less waterproof, keep the mess contained to a limited space, be easy to move, and fit inside the storage compartment of a camper (not too much to ask, right?). A friend saved large dog and cat food bags for me which I cleaned, and after that I was off to the sewing machine! 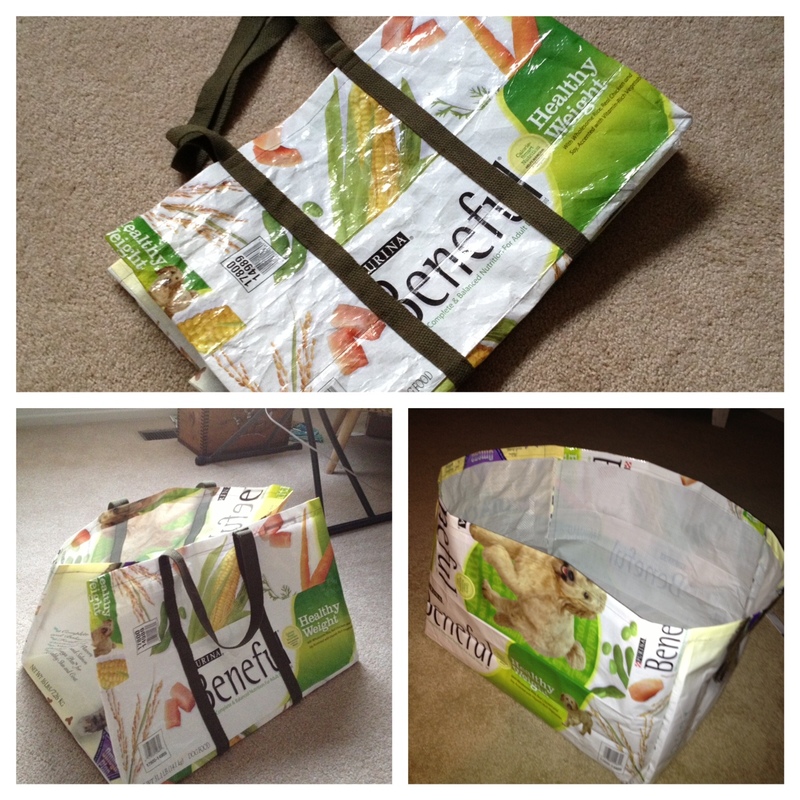 One 30# dog food bag made the sides and bottom, and two cat food bags made the ends of the tote. It is large! Approx. 24″ x 16″ x 16″! I purchased about 4 yards of 1″ nylon webbing for the handle which is continuous and runs under the tote for extra support and strength. I added nylon webbing pulls on each end so it is easy to grab. The gift was a big hit, we can’t wait ’til next camping season to use it!